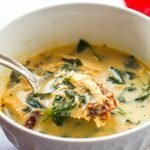 This creamy sun dried tomato chicken soup is so rich and delicious. If you are looking for a very satisfying low carb or keto soup, you've got to try this one. Each serving is only 6.6g net carbs! Add 4 cups of chicken broth and whisk in 1 tablespoons of Better than Bouillon. Next add the cauliflower, cover with a lid and cook until fork tender. This should take about 8 minutes. Spoon the cauliflower into a blender but keep the cooking liquid. Add the Parmesan cheese, 1/2 cup of the cooking liquid and blend until nice and creamy. Add the sun dried tomatoes, garlic and cooked chicken to the chicken broth mixture. Mix it well and then pour in the cauliflower cream from the blender. Let this cook for a few minutes and then add in the spinach and cream. Let that cook for a minute or two more and you are ready to serve.